Cemusa installs more than 170 Panasonic 70-inch displays in various Spanish airports. Throughout any major airport, passengers are exposed to panels and displays which offer flight details, global news, entertainment, advertisements and more. Spanish airports alone see over 500,000 people pass through them every day, making reliable and effective digital signage imperative for an airport's successful communication. 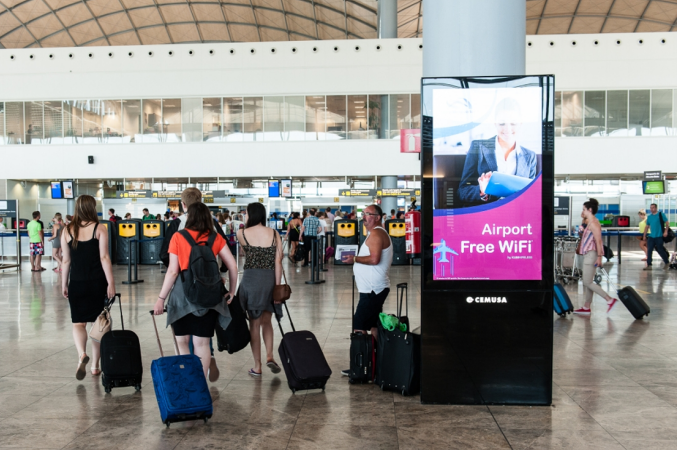 Spanish airport operator, Aena, investigated the use of digital signage for advertising spaces in all of its airports, including the two biggest in the country, Adolfo Suárez Madrid-Barajas and El Prat, following termination of the previous contract. They were looking to have the best visibility, image quality, and colour intensity for all passengers, while offering modern advertising and communication through more technologically advanced solutions; developing an innovative commercial offering. The exclusive management of all airports of the peninsula and the Balearics was awarded to Cemusa, a leading international company in outdoor advertising based in Madrid. Cemusa has specialised in the design and integrated management of street furniture for more than 30 years. They currently manage various types of advertising media in large cities such as New York, Madrid, Rio de Janeiro, Barcelona, Boston, Lisbon, Bologna, and Brasilia. Cemusa presented a proposal that included installing a total of 171 advertising spaces with 70" displays. The displays selected were the Panasonic TH-70LF50, LCD displays that can operate continuously 24/7. The durable displays feature high image quality and high brightness levels. "Panasonic displays were selected on account of the brand's outstanding performance which has made it the best choice for commercial displays in the European and national AV markets," said Oriol Massagué, Product Manager of Panasonic Visual at Panasonic System Communications Company Europe. "Our displays are renowned for being robust and able to withstand knocks and drops thanks to a resistant metal structure. This makes them ideal for this type of busy environment. "Furthermore, working with partners of the high standing of Cemusa, Telefónica On The Spot Services, and Crambo, we will always ensure a successful project," Oriol Massagué continued. Thanks to their 700 cd/m2 brightness and 5,000:1 contrast ratio, coupled with the 70-inch size and their wide viewing angle, the TH-70LF50 displays are highly visible in any public space, which makes them particularly ideal for installation in airports and in digital signage applications. Their minimalist design and depth of just 89 mm also contribute to their suitability. Moreover, the LF50 series can be operated continuously, day and night, while its LED backlighting saves energy and reduces consumption to just 260 watts. Despite this significant reduction in consumption, these displays still offer a high level of brightness at 700 cd/m2, representing a revolution in energy efficiency which was decisive in these devices being selected for use in the Spanish airports. special protective glass that provides additional security against possible incidents that may occur. installation in unusual places that are difficult to access since the compatibility of the LAN control system of the LF50 series means that displays can be managed remotely. In addition, Panasonic has also removed fans, thus preventing dust particles from penetrating the monitor.